The mission of Grace Lutheran Church is as follows: "Grace is a caring community of believers in Jesus Christ reaching out to you in God's love." The members of Grace are working to make that mission a reality by offering weekly worship that centers on the good news of Jesus Christ. Sermons are based on God's Word. Worship music is led by both organ and a worship band. The worship band plays on the fifth Sundays during the school year and on the second, fourth and fifth Sundays during the summer months. Grace actively supports the ministries of Luther Crest Bible Camp and Knute Nelson Memorial Home and the mission of the Evangelical Lutheran Church in America, with which Grace is affiliated. Plans for the Grace congregation were begun in 1898. The first building was completed in 1905 and the church was incorporated in 1910. 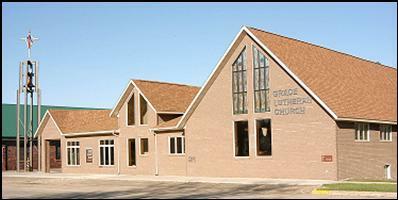 Grace congregation strives to be a welcoming community of believers in Christ Jesus.